Mark and Vlad prepping a prototype for upcoming tests. As Director of User Experience and Design, I am tasked with driving the direction of our design and user experience methodology. 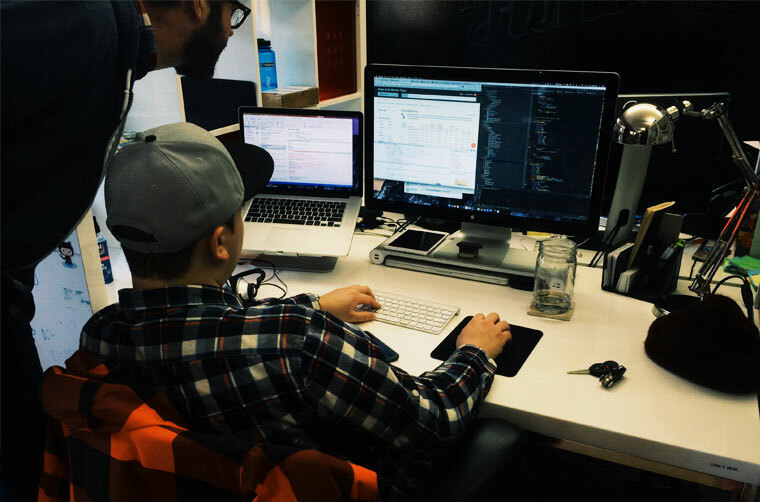 One important piece we’re implementing is the role of validation in the design process. Validation takes many forms, but today I want to focus on a very specific form - testing. Mention testing and you’re likely to conjure up mental images of large-scale programs with numerous professionals locked in conference rooms asking pointed questions about a product - be that digital or physical. Add on travel, recruiting, analysis time and cost, and it’s no wonder businesses never really take validation seriously. After all, the marketing group already did all the research anyway. Thankfully, businesses are convinced that design is a competitive advantage. In fact, even the blue-chips are launching innovation centers these days. Even so, we still see enough businesses that have trouble getting outside of myopic views they have on what it is they are trying to create. “Validation” is still seen as “how well it matched the brief”, not “how well it measured with constituents”. It does not need to be complex, bloated or cumbersome. Repeat after me: a little tells you a lot and anything is better than nothing. That’s your testing (and research) mantra. What does that mean for us, and our clients specifically? Let’s take a look at a few different options for incorporating testing into a design project at three different points. Most of these options are pretty lean, implementing many of these requires no prior testing or research experience. 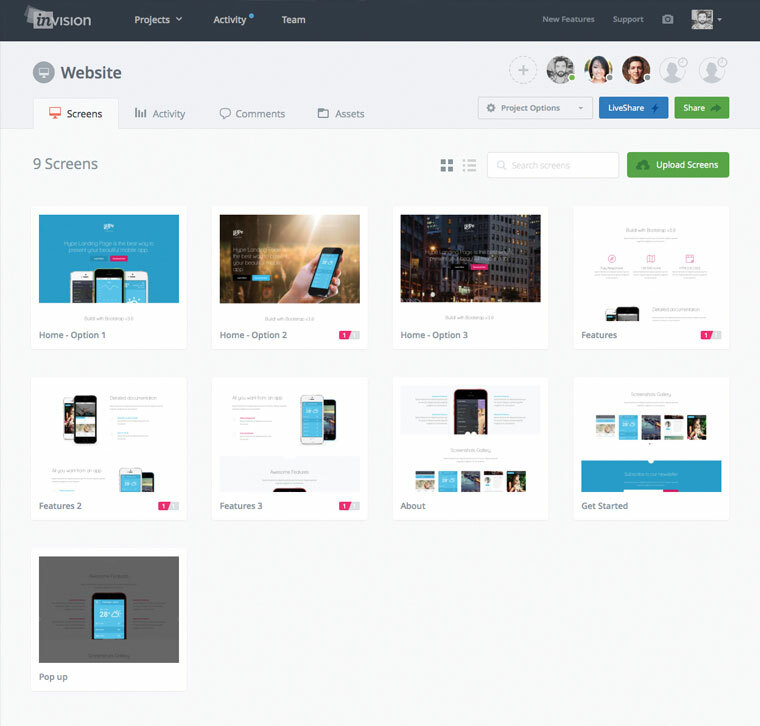 Invision is becoming a UX team favorite for quick feedback in early phases. Testing design concepts with a service like Verify, Invision, or posting design concepts to Pinterest, isn’t very complex. But assuming you are doing this at the very early stages, these options can be a quick and useful way to narrow your field. At this stage, you’re typically posting non-interactive flat design comps. Changes in direction are not typically expensive because you haven’t really executed much, but outside feedback on an idea that really doesn’t mesh with your intended audience can save a lot of grief later. It’s very helpful to get early insights to react to. Admittedly what you’re testing here is superficial in nature, but it is still valuable. Creative is often the most subjective aspect of an experience, so it’s worth the time to get real feedback on something that people tend to react to personally. With this option, you’re testing some form of interactive prototype, coded in HTML or built in a program like Axure or Protoshare. Regardless of artifact you use, it’s useful to expose that work to a live fire exercise to see what works. While this is a great option for getting deep insight very quickly, there are some drawbacks. First, the fidelity of the product and timing are both key. Will your test product be at a point where it will be judged fairly, or are you pushing something out to make your date? There’s no wrong answer, but that decision is going to have a huge impact on what you uncover. Furthermore, if you test too late in this fashion, changes identified may be far too costly to act upon for initial launch. Another dimension is the often-hidden overhead when executing testing mid-stream. Things like test moderation, recruitment and incentives for participation are often things people don’t consider before diving in. This is probably the example that comes to mind when thinking of testing a design product. Virtual testing is enacting very specific tasks on a live product with a service like usertesting.com or userzoom.com. These options are very good for testing very specific micro-interactions and getting very specific feedback on narrow issues. If you’re in the iterate and revise mode, this is perfect. The drawback here is that getting feedback on large scale ideas isn’t going to happen. If you’re about to burn the experience to the ground and start fresh, this isn’t the best option. This form of validation often comes too late to enact large-scale change. Bringing people into the design process isn’t really anything new. It’s a concept that the industrial design world has been practicing for decades. The digital landscape is a little different, while a lot of people talk about testing as a good idea, initiating a program often raises more questions than answers. Incorporating some form of testing into your design process is critical to success. That does not mean these programs need to be far-reaching or grand in scale. In fact, the more successful programs I’ve seen were often lean, improvised and very much guerilla in nature. The point is: find a plan that’s right for your business, your product, and that will fit in with everything else you are already doing. The role and value of testing in the design process is relative to what you are trying to achieve. The point is to get some form of real feedback on the work and drive decisions around that, not the personal preferences of people sitting in a conference room.